Police are looking into the treatment of customers by a division of RBS which was set up to help companies in trouble, the BBC has learnt. GRG was the part of the bank tasked with helping small businesses, but it has been accused of mistreatment by some customers and MPs. Officers in Scotland are conducting inquiries into the GRG unit, but are yet to open a formal investigation. RBS said it would co-operate with any request for information. Separately, the BBC has obtained a memo written by a GRG employee which appears to show staff were encouraged to extract money from struggling firms. The bank said the language in the leaked memo - written in 2009 by a junior GRG manager who has now left the company - was "wholly inappropriate". The UK's financial watchdog, the Financial Conduct Authority (FCA), has told the BBC it plans to publish a report into the allegations of the mistreatment of customers before the end of the month. Scotland's national police force was asked last year by crown prosecutors to examine GRG's handling of clients, the BBC understands. Police Scotland's economic crimes unit has been gathering evidence to see whether there might be enough to pursue a criminal investigation against the bank. No charges have been brought and no formal investigation has been launched. The FCA has looked into the allegations of misconduct at GRG, and this week agreed to allow a legal adviser to study its report. Shadow business minister Bill Esterson said that as a result of GRG: "For years, thousands of people's businesses were destroyed and ruined and their relationships broken up, and sadly people [have] taken their own lives." He added it was "not before time" that police were looking into the RBS unit. Meanwhile, a document, seen by the BBC and widely circulated in one division of GRG, speaks about staff extracting revenues from struggling small business customers, instead of trying to cut the clients' debt and return them to health. The memo entitled "Just Hit Budget" talks of applying especially high interest rates, which could then be reduced if customers signed over a stake in their business or property. One line says: "No deal, no way. Missed opportunities will mean missed bonuses." Norman Lamb, vice chair of the All Party Parliamentary Group on Fair Business Banking, said: "This shows that within RBS there was a culture of no real interest in rescuing companies. There was an interest in maximising bonuses and improving the balance sheet." The Liberal Democrat MP called it "a scandal of incalculable proportions", saying the memo raised the question of whether criminal offences had been committed. "There needs to be an urgent inquiry into this. It's a blueprint for abuse of business customers in the most shocking way," Mr Lamb said. 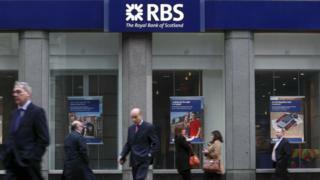 RBS said: "The language used in the document was completely inappropriate and the bank does not condone it." Police Scotland said the Crown Office - Scotland's equivalent to the Crown Prosecution Service - would consider information that meets the standards required for criminal cases. The government said it did not comment on leaked documents or ongoing investigations.